It has been a really long time since I have made a layer cake, so I figured this weekend was a good time to do so. I am normally not one to stick with traditional plain flavors, but red velvet was on my mind. 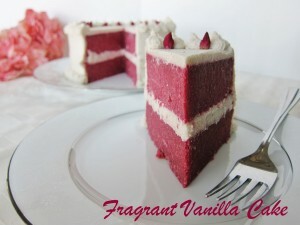 Just a classic red velvet, with creamy white frosting! The last time I made a raw layer cake, honestly, I did not know what I was doing. I used pretty much all nuts for the base, and it was so dense, it was hard to cut and looked like it was falling over when I did cut it, with the frosting in the layers all squishing out the sides. Not attractive. But what else would you expect, it was really my first raw layer cake and I did not know better. I now know that too many nuts make a cake base too heavy and it is better to use lighter things like coconut flour, and sprouted flours (but not nut for me). I have since revised my "baked" (I say baked because they are dehydrated) cake recipes many times, and I know I still will, but I am feeling pretty confident in how this red velvet recipe turned out. 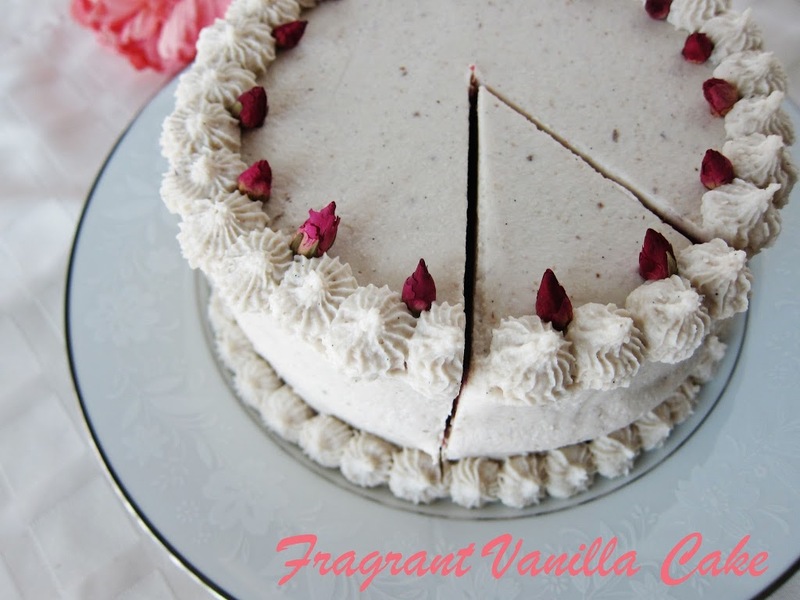 It is light, for a raw cake, sweet and delicious! I knew it would be good when I was making the batter and I could not stop tasting it. It was lovely as well with the beets for color (don't worry if you do not like beets, you could not taste them) and better than all that nasty fake red dye traditional red velvet uses. This is as close as I get to classic cake recipes, my take on Red Velvet...and it was delicious! Combine buckwheat flour, coconut flour, sea salt, in a large bowl and whisk together until and set aside. To a food processor, add the vanilla, beets, dates,and nectar to the processor and process until pretty smooth. Add the wet ingredients to the dry, and stir together until smooth and well incorporated (the batter will be stiff, it takes muscle, but if it seems too dry (because some dates or beets are dryer than others) add a little filtered water until it reaches the consistency of thick brownie batter, which is what it should be). If you have a stand mixer, feel free to use it! Form the batter into 2 mounds on a lined dehydratpr sheet, then form each into a 6 inch circle (you can always trim the edges later if not perfect). Dry at 115F for about 16-18 hours, until the cakes are dry but still a little moist in the centers then remove from the dehydrator and place in the fridge to cool (at this point you can trim the edges if they are uneven). Meanwhile, to make the frosting, combine all ingredients but the coconut butter and oil in a food processor and process until smooth. With the motor running, add the coconut butter and oil and process a minute more. Pour the cream into a bowl and let sit in the fridge until the consistency of whipped cream. Thanks so much Miliany :)! You are so sweet. I hope I can convert some carnivores with my desserts, or at least get them to try more healthy ones ;)! Have a great day as well! Definitely an Excalibur. I have a 5 tray and it cost $165. Well (in response to one comment), I do eat grass, carrots, fruits and vegetables, but those definitely are not the only things. 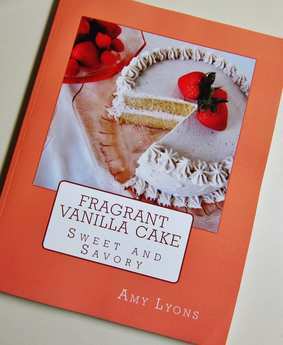 This cake looks awesome, and I'll be making it within the next few days along with some yummy raw granola. it's really is not easy for me to translate your recipes in German, but I have to try it :)) <br />I've never seen such beautiful creations anywhere. <br />many thanks for your effort! Amy, this is so beautiful!!! 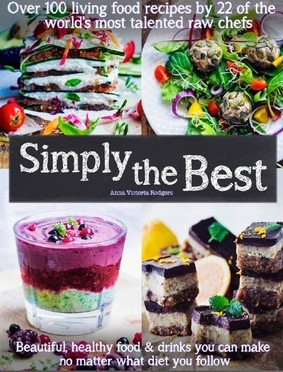 You have such a gift for creating fabulous raw desserts! !<br />I wish I could find<br />Young Thai coconuts in my area. When I have found them, they were bad (purple inside) so disappointing!! Thank you for sharing your awesome creations with us! Thank you so much :)! I hate that when they are purple...I have returned some like that before. Do you have any Asian markets near you? I have been buying mine at one for a while here and I have never gotten a bad coconut from there, plus they are cheaper. I am happy to share with you, thank you for your kind words :)! The purple coconuts are very young coconuts. Their meat is very thin and slimy and the water tends to be pink-ish. As long as it smells nice like coconut it's not a bad coconut. The bad coconut would not smell pleasant and you would definitely know that's a bad one. I tend not to use the purple ones because the water tends to taste off and the meat is no good for use in recipes. Too thin. This looks amazing! Thank you for your inspiration. I also make lots of raw cakes, also proffesionally. I really love how your cakes are so colorful and beautiful decorated. Do you have any education in cake decoration? Thank you so much :)! It means so to me much that I inspire you! I don't actually. I am self taught, I just have an artistic eye since I have a degree in studio art. How do I get raw coconut flour? I an new to the raw organic diet and red velvet cake is my weakness, but I shutter at the thought of all the dyes and chemicals. Any tips for a newbie? 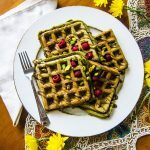 Click on the word coconut flour above and you will be brought to my helpful hints page and how to make it. It is an easy process ;). My tips for making this cake are to follow the directions exactly, and ask me if you have any questions I am happy to help :)! I want to try this as I LUV the original southern treat. However, usually cocoa, vinegar, and buttermilk are used to give it that authentic flavor. 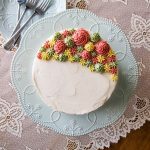 Here in the raw version, I see the vinegar for the frosting but what about the cocoa and buttermilk substitute for the cake portion? 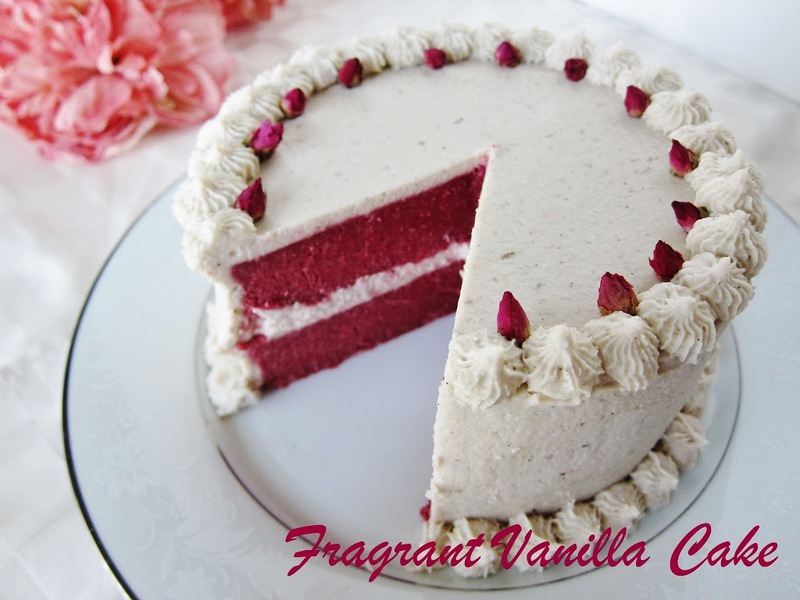 It tases like red velvet without the cocoa and buttermilk. I did not add the cacao to the cake part because it would turn the color muddy. Trust me, this is good as it is here ;). Looks good-can't wait to try! Do you have any advice if I don't have a dehydrator? You can use your oven at the lowest temperature if you do not mind it possibly not being raw. Just crack the door open with a foil ball or wooden spoon, and the cake will probably take about half the time so check it about 1/4 of the way through to see how it is doing. Hello. Amy. This looks amazing! I have a question, though. The link for the tips on how to make raw coconut flour doesn't work. Actually, each time (since you've moved your page) I try to access your page with tips about main ingredients, I get "Page not found". Is it just me or is there some kind of problem with links or something? I'd really like to read those tips again. Thanks for your answer. And many thanks for your beautiful and delicious recipes! Can you make it ahead of time and freeze it. Will it still taste the same once thawed? I would think so. I have frozen my cheesecakes successfully and thawed them and they have more moisture than this. Just be sure it is in an airtight container. 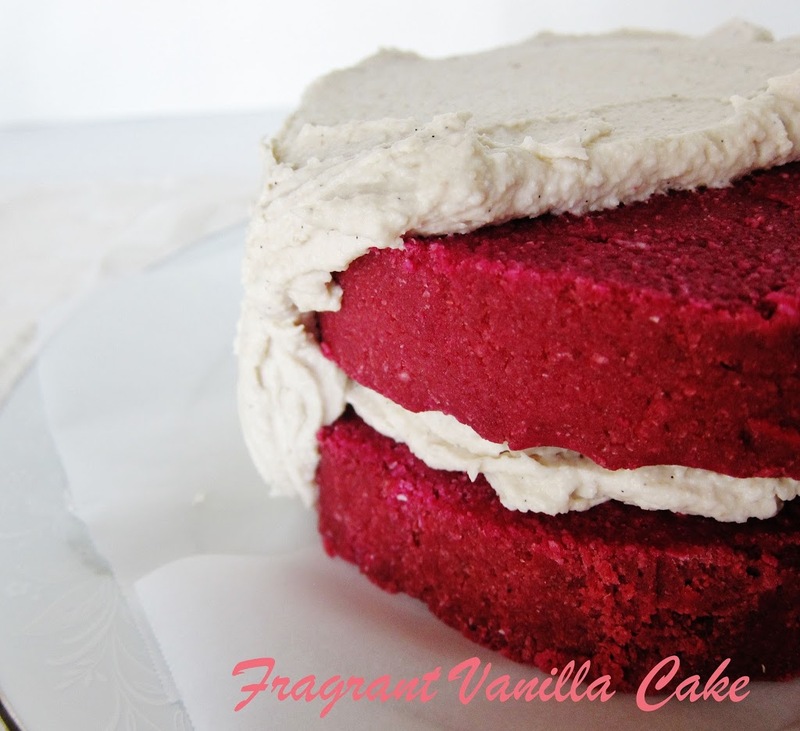 I needed a raw red velvet cake recipe to make an anniversary cake/gift for an ex-coworker. This is definitely it. 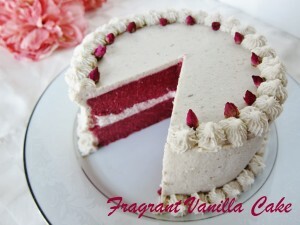 I have never made a red velvet cake of any kind. 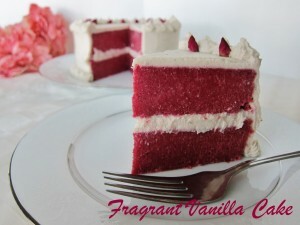 I have never tried a raw red velvet cake ever. This is definitely the recipe I needed. The frosting looks perfect, too. I am going to revisit your website & try more of your recipes. I am so happy my recipe works for you :)! Does the base have a coconut taste? No, it does not. More of a vanilla taste.